Universal Studios Florida® has working film sets and it was also built specifically as a theme park. Its mission is to show you inside movie making through thrilling rides, interactive adventures and shows. You can even shop in a replica version of Kwik-E-Mart, the convenience store made famous by The Simpsons. The park has six themed areas, or “backlots” as movie makers refer to outdoor film sets, that surround a lagoon. Go right to the heart of the movie world at the Hollywood backlot. Here you can take a nostalgic trip back to the 1950s at Lucy: A Tribute, a walk-through exhibit that celebrates Lucille Ball, one of the most beloved redheads of all time. Blast to the future at the Terminator® 2: 3-D experience, and pick up some tips for Halloween from artist demonstrations at the Horror Make-Up Show. More tricks of the movie trade are on exhibit at the San Francisco backlot. Hop aboard the Disaster! Ride, and learn about the stunts and special effects that go into blockbuster action movies. You may even become an extra on one of the sets. The New York backlot has The Blues Brothers® Show and a treat for roller-coaster fans: the Revenge of the Mummy® ride. This indoor journey, often through darkness, reaches speeds of 45 miles (72 kilometers) per hour. Go even faster at the Hollywood Rip Ride Rockit®, during which you become a music video star and feel the rush of traveling at 65 miles (105 kilometers) per hour. Most of Universal Studios Florida®’s attractions are indoors, making it a great place to visit during Orlando’s steamy summer or on rainy days. Spring break season can get crowded and opening hours change to reflect high and low visitor numbers. Play a few rounds of golf at these Nicklaus-designed, award-winning courses which are located in the very heart of sunny Orlando. Join in the excitement at one of Florida’s top sporting, music or entertainment events in this vast state-of-the-art football stadium. Florida's principal convention center is a large and stunning glass and metal building that hosts national and international trade shows and public events. Delve into the long history of Central Florida at this state-of-the-art museum, where the past comes to life through exhibits that engage all the senses. With hundreds of animals, exotic gardens and outdoor adventures, this family attraction has fun and excitement for all ages. This family-friendly, Caribbean-themed hotel is walking distance from Universal Orlando™ and Universal CityWalk™. 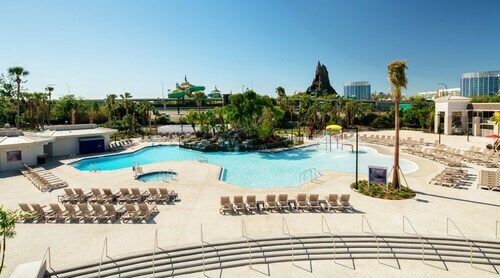 Guest enjoy Early Park Admission* to The Wizarding World of Harry Potter™ and Universal's Volcano Bay™ water theme park one hour before the theme parks open with valid theme park admission. 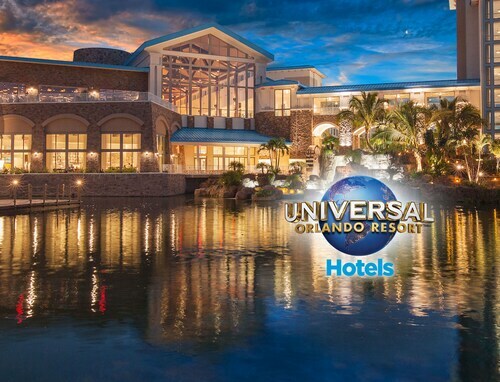 Located a short walk from Universal Studios Florida™, Universal’s Islands of Adventure™ and Universal CityWalk™, this 1000-room hotel offers Early Park Admission* to The Wizarding World of Harry Potter™ and Universal's Volcano Bay™ water theme park (now open) 1 hour before the theme parks open with valid theme park admission. 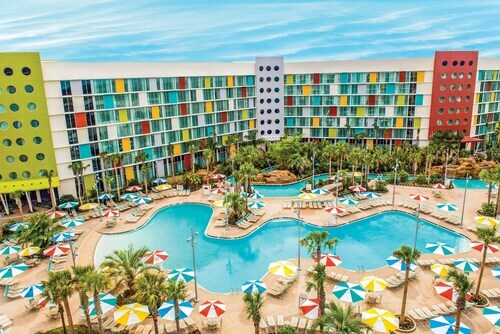 This family-friendly Orlando resort is within a 15-minute walk of Universal Studios Florida™ and Universal CityWalk™. Hollywood Drive-In Golf and Universal’s Islands of Adventure™ are also within 1 mi (2 km). Located in Sand Lake, this resort is within a 10-minute walk of Titanic the Experience and Pirate's Dinner Adventure. Universal’s Volcano Bay™ and Universal CityWalk™ are also within 2 mi (3 km). 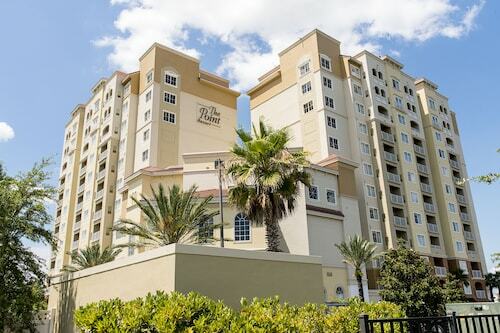 The Best Western Orlando Gateway Hotel is 2 blocks from Sky Venture / I Fly Orlando. 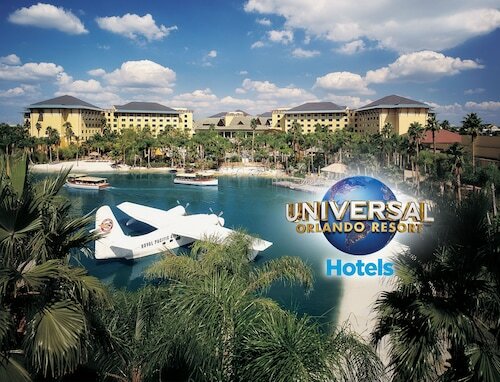 This Universal Studios Partner Hotel provides complimentary scheduled shuttle service to Universal Studios, Islands of Adventure, and SeaWorld. Located in Sand Lake, this golf hotel is within 1 mi (2 km) of Universal’s Volcano Bay™, Universal Orlando Resort™, and ICON Orlando. Ripley's Believe It or Not and Fun Spot USA are also within 1 mi (2 km).